Charlotte Hall Veterans Home has been proudly “Serving Those Who Served” since 1985. 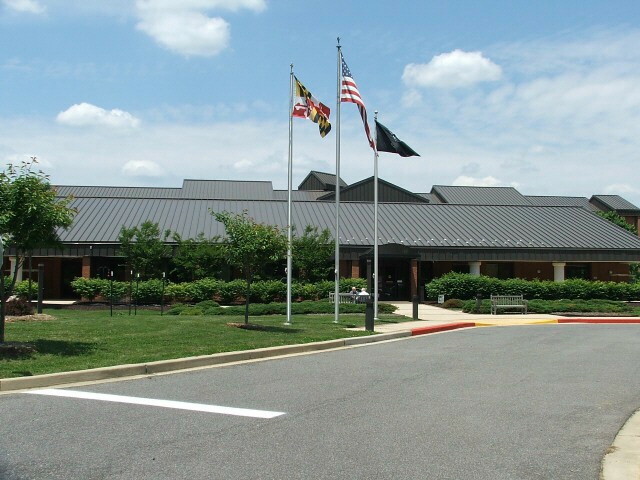 The Home is situated on 126 beautiful acres in St. Mary’s County, and offers and a continuum of care from the 168-bed assisted living program to the 286-bed skilled nursing program. Charlotte Hall Veterans Home also offers memory care in secure units. The Home is Medicare/Medicaid certified, and all veterans receive a per diem subsidy from the U.S. Department of Veterans Affairs that reduces their cost of care. The Home is inspected annually, as required by the Office of Health Care Quality, MD Dept. of Health & Mental Hygiene, and by the U.S. Department of Veterans Affairs. Our vision is to continually develop and deliver a safe, dignified and compassionate health care system; and provide a nurturing and engaging home environment for Maryland’s veterans. Giving back to veterans and their spouses who have given so much through their service has never been easier. Charlotte Hall now accepts monetary donations online. Donations play an integral role in ensuring residents enjoy the comforts of life in and outside of the home. Medical services, final hours arrangements, and personal care items such as toiletries and clothing are some of the ways funds received support residents. Donate now to Charlotte Hall Veterans Home. Thank you! For questions regarding donations, please contact Ashley Radano, Director of Volunteer Services, at 301-884-8171, ext. 664. Complete range of clinical services under the direction of the Home’s Medical Director and other licensed healthcare professionals, for 24 hour care, seven days a week. An eligible applicant is a veteran who served on full time active duty in the U.S. Armed Forces, other than active duty for training, and was discharged or released under conditions other than dishonorable. Maryland resident, at least 62 years of age or if under age 62, deemed disabled by either Social Security Administration or the US Department of Veterans Affairs. For additional Admission information and to download an application packet please go to our web site. You may also call 301-884-8171, Ext. 409 or email admissions@charhall.org. For more information visit the Charlotte Hall Veterans Home website.